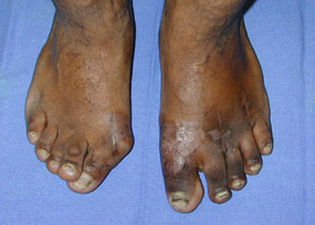 Rheumatoid arthritis of the foot causes painful deformities including hallux valgus (bunions), claw toes, and painful metatarsals, as a result of dislocation of the toe joints. Special shoes and inserts can be worn, although surgical correction is often eventually required. The surgery is usually performed as a 1-2 night hospital stay and can be done under a local anaesthetic ankle block with intravenous sedation. The surgery usually involves straightening of the big toe by fusing the joint at the base of the big toe with two titanium screws. 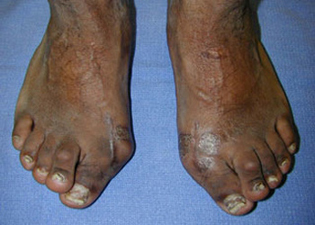 Pre-operative photograph of a patient with rheumatoid arthritis of the feet. The patient complained of painful rubbing over the area of the bunion and top of the clawed toes with shoe-wear. 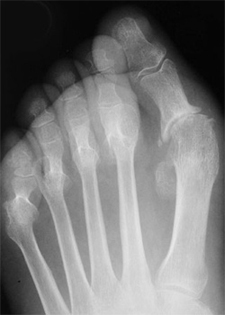 Pre-operative x-ray of the patient's left foot. 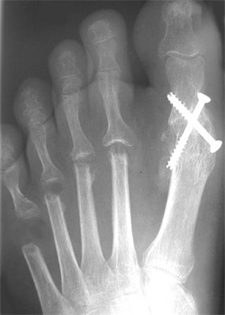 Post-operative x-ray of the operative foot. The big toe has been straightened by fusing (permanently stiffening) the joint at the base of the big toe with two titanium screws. The lesser toes have been straightened by removing the metatarsal heads at the base of each toe.